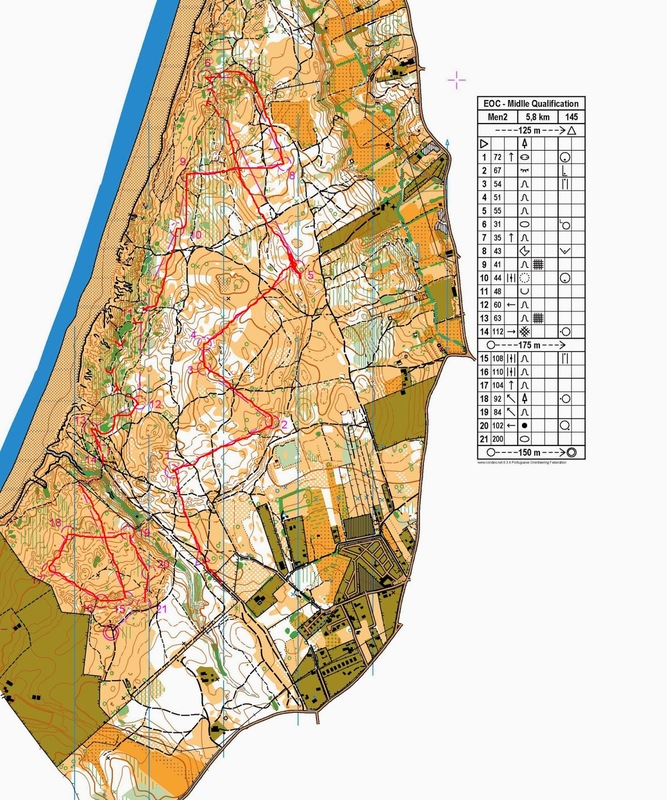 European Championships was an interesting experience this year - controls in the wrong places, poor maps in the qualification races, horrible terrain with man-eating bushes in the long qualification, course maps leaked before the long finals and so on. It was also a lot of fun! Mostly this was laughing about what could go wrong next, but I did enjoy all four races that I ran. Middle qualification went well, and apart from the inexplicable map at number 5, a poor route choice to 12 and getting a bit stuck to 13, and I finished 8th in my heat, about 1 1/2 mins behind. Long qualification was also fine, except for getting stuck in bushes on the way to 11 for 2 minutes! Again 8th in my heat, 2:40 behind. The middle final was not a good performance for me. I lost time on 4 of the first 5 controls, and in this terrain that is game over. I finished 28th, 3:11 behind having lost about 1:30 in the beginning. Tracking here (Although I was not tracked). The long final was much more successful. I produced a good performance physically and technically, and finished 16th, 4:41 behind the leader. 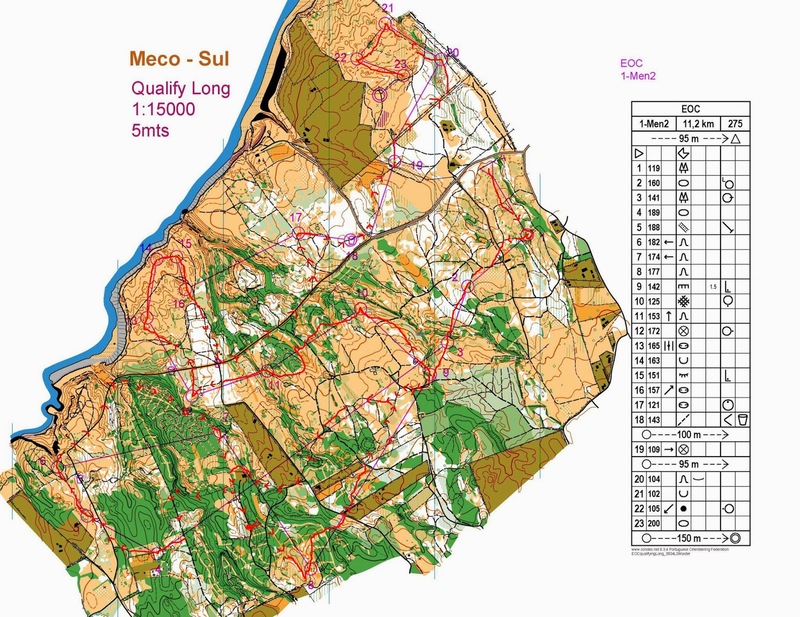 This is my second best ever long distance result, after 9th in WOC 2009. Tracking here and 2d rerun here. The relay was the day after the long, and with 4 races in 6 days in my legs, I had to drop out of the GB team as I felt I had nothing in my legs to give. It was disappointing for me, but also partially expected. The boys did a very good job to come 5th without me! I flew directly to Sweden to a Tiomila camp with my club, IFK Mora, from EOC. The non-EOC runners had a tough weekend with a lot of training/racing, and the EOC runners did what they felt they could after a tough championships. I just did some easy training before the main focus of the weekend - Kolmårdskavlen. A 5 man relay with almost all of the best Swedish clubs (and some overseas clubs too). We chose a very strong team to try and win the race - and that is exactly what we did! Andreas Holmberg and Johan Lindberg ran really well on legs 1 and 2 to send me out in 3rd, just under 2 minutes behind. I had a very good run (and fastest leg time) to pull us into the lead on 3rd leg. Zsolt Lenkei (despite twisting his ankle on 1st control) ran well to change over 4th, just under 2 minutes behind, and then Vojtech Kral, our Czech superstar (fresh from EOC relay silver medal) passed the first 3 teams to win the relay for us! I am told that IFK Mora hasn't won many big senior relay competitions - with only a Rånässtafetten victory in the past decade or so - so hopefully this marks the start of a successful new era for the club. Some nice articles about the victory here and here. @EOC: every time you laughed there were people sad, because they couldn't give you the best they can do! @Alexandra - I meant that instead of being stressed about mistakes and problems, we tried to keep positive and see the fun(ny) side of things - it is important not to let things affect your performance (which happens very easy for some athletes). 95% of everything was very high quality - the courses were generally very good, the final maps were good. The sprint final especially seemed to be really interesting (although I didn't run it). @Graham Gristwood Yes, I understand you :) Thanks for your nice words!